Firstly, all 1275cc heads will fit all 1275cc engines. Most of these heads have casting number 12G940, and it was only the machining at the factory that made them different. 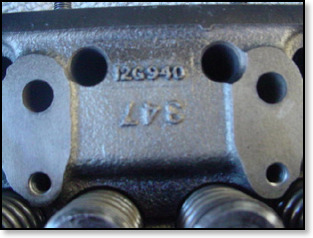 Even 1275cc heads with different casting numbers will fit. If you are fitting a 9 stud head to an 11 stud block, of course you will need to drill two holes, but that isn't a difficulty. You can use a head gasket as your template, but do make sure you use a nice square drill stand and don't do it freehand! But here's the rub (as Shakespeare used to say). 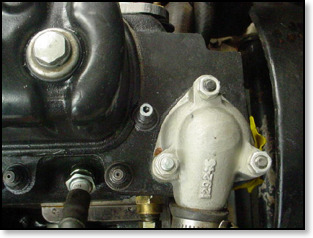 The "front" hole in the 11 stud head, the one just behind the thermostat housing, originally (ie: Cooper S) used only a 5/16" bolt passing into the block - note: bolt, not stud. And there is a very good reason for this. The threaded hole in the block is not very deep before it enters the water chamber behind the water pump. All the other 10 holes are quite deep. If you read the Cooper S Workshop Manual, you find that this front bolt should only be torqued to 25 ft lbs, not 45 ft lbs like all the others. Torque it to 45 ft lbs and you run a great risk of breaking the front off the block! Trust me - I've seen it happen. 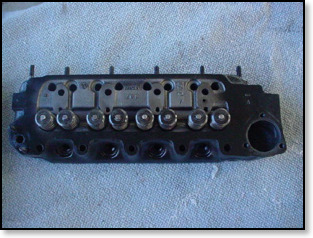 Here is a photo of the 10th stud, behind the thermostat housing. I paint the head of the stud as a reminder not to tighten it past 25 ft lbs. Of course, over the years and out of simplicity, many blocks have had this 11th hole enlarged to 3/8" like all the others. And those of us who have converted 9 stud blocks to 11 studs, usually make the two extra ones 3/8" and fit the normal studs. So beware. All 11 studs/nuts might look the same, but don't tighten the front one to 45 ft lbs.